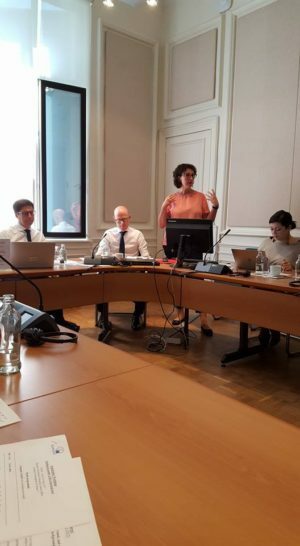 On May 16 Eurofound organized a stakeholder meeting on the topic ‘Building-up quality of life in the local area’. Dr. Ileana Rotaru from Nevo Parudimos and ERGO member presented the perspective of Social hubs in rural Europe: social inclusion and Roma integration. Between 2017 and 2020 Eurofound will carry-out exploratory research on ways to build up quality of life in the local area, whether urban or rural. In particular, it seeks to investigate two questions: a) what physical and social factors in the local area are of particular importance for people’s quality of life? and b) what can be learned from initiatives to enhance quality of life in the local area? Our input to the meeting was that Roma communities cannot be forgotten when the ‘local dimensions’ of quality of life is targeted in this project. We stressed the necessity of including Roma in different types of initiatives and policies aiming to improve quality of life. Present at the meeting were Mr. Tadas Leonikas from Eurofund, Eurofound Research Manager Mr. Hans Dubois, different stakeholders from EU state members and municipalities and European Commission representatives: DG EMPL (Unit: Modernisation of Social Protection Systems), DG SANTE (Unit: Health determinants and inequality) and from DG REGIO (Unit: Inclusive Growth, Urban and Territorial Development).